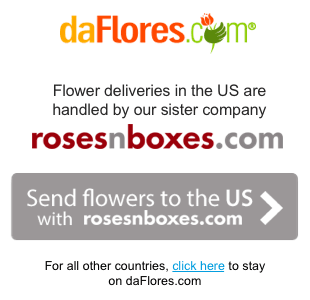 Send flowers to Canada with daFlores and experience the best. Canada, one of the United States' two closest neighbors, offers beautiful flower deliveries made by passionate experts. Since they use fresh flowers daily, you can trust daFlores' international florists to create gorgeous arrangements and deliver them at your leisure. When you send flowers to Canada with daFlores, you're taking advantage of our long-standing tradition of quality and attention to detail. Canada has hundreds of cities, but daFlores is picky: we visit all our florists in Canada individually and won't work with a partner unless that store's been in business at least a decade. More importantly, all our team must bring in fresh flowers every morning for your international flower delivery. Our flowers come from professional growers and are guaranteed to last a week or more. Whether you choose stunning romantic bouquets or want something for your Mom, we have the expertise and good taste you require. Let's spend a moment explaining how we pull off our flower deliveries in Canada. 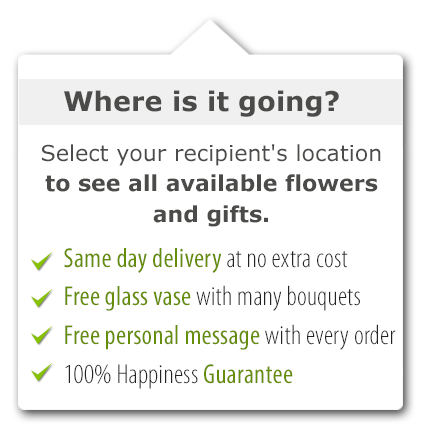 DaFlores flower delivery in Canada offers a broad range of choices: Canada is huge. Most of the population is centered in the south, while the northern territories, not provinces but a different type of land space, offer up some of the world's most frozen and wildest places. From the temperate coastal botanical gardens of Vancouver to mountain cities like Calgary, we stick to one florist per city or large city neighborhood. Perhaps Canada's most famous product is maple, which is found on its flag, in its syrup and other good things. These beautiful trees are a symbol as majestic as the country, but the tree doesn’t reflect Canada's diversity, only its strength. We've already mentioned the sharp divide between southern provinces and northern territories; but on the East coast you'd think you were in Europe, and the Maritime Provinces are a whole different world. DaFlores florists in Canada help you celebrate: The name Canada derives from an Iroquois Indian word for “village” -- kanata. Perhaps that lies at the heart of Canada's appeal: through beautiful flower delivery in Canada, we make the world no larger than a village and bring your loved ones near. Canada has much to celebrate, and so do you. The perfect blossoms of our mixed flower bouquets, are just part of a hugely varied flora and fauna. The coastal west is more temperate, while on the east you can have winter for months. Tall, soaring cliffs and scenery make up for such difficult climates. The Canadian Rockies are the highest peaks in North America, but you'll also see vast forests and lakes inland. There's more freshwater in Canada than in any other country and our flowers really like that! The Niagara Falls are also quite astonishing, and those with a passport can cross a bridge into the States and back. But you'll also find volcanoes in Canada, and temperate zones, all of which our international florists can use to great advantage. No matter what you're celebrating, though, our florists in Canada can help you out for every occasion, even with the tasteful arrangements that are so popular in business gift-giving. Canada as a whole is a country to celebrate. But when you and your loved ones need to send flowers to Canada, it's daFlores who can give you cause to celebrate. 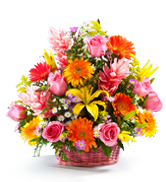 Our florists in Canada are always on hand to help and can even arrange same-day delivery on most occasions. Since we use fresh flowers every morning, you can always be sure that your flower delivery in Canada is the best you'll ever see. We use an extensive network of local florists to send your flowers just about anywhere in Canada. Some of our most popular places for flower delivery in Canada include Toronto, Ottawa and Vancouver. It's quick and easy to send fresh, beautiful flowers to Canada! Same Day Flower Delivery to all cities in Canada. Para ver esta página en Español, favor visitar nuestra página de Enviar Flores a Canadá.